Happy Monday, friends! For this weekly post, I’m ditching the title Merci Mondays in favor of Shiny Happy Mondays. I was going for alliteration, but after sitting with it for a week, I decided I hate ‘merci’ and most other non-French ‘m’ words. I happen to really like the R.E.M. song Shiny Happy People, and since Mondays are usually anything but shiny and happy . . . well, there you go. I’ve also decided that instead of generating a list of happy things (too much pressure), some weeks I may just choose to meditate on one happy thought. Less is more. My Mom often says that many of the happiest memories of her youth were spent during summers at the beach: waterskiing, building bonfires and roasting marshmallows, and camping out with girlfriends. And one of the favorite things she and her friends would do during weekend sleepovers at the beach was paint each other’s toenails. 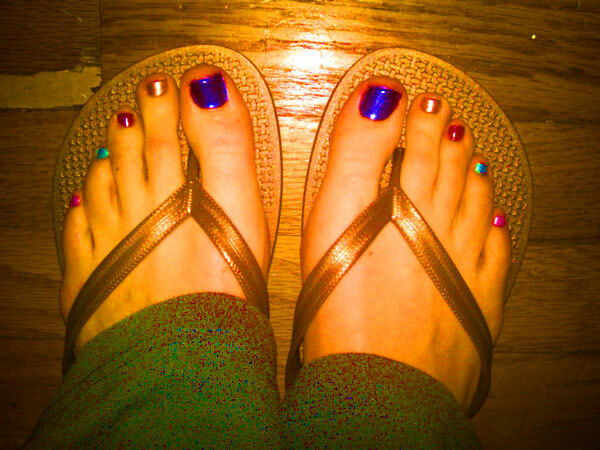 Just for fun, they would paint each toenail a different color, and they called this look beach toes, for no over reason than they did it while they were at the beach. So why is ‘beach toes’ my happy thought for this Monday? A few reasons: 1.) It’s not really ‘grown up’ to paint every toenail a different color (you’d never display these babies through a pair of open-toed stilettos at a black tie affair), but it’s fun and quirky and celebrates being a bit unconventional, all of which I like. 2.) It’s a reminder not to take yourself so seriously. 3.) Because it comes from my Mom, who grew up as a child of the 1960s, it makes me think of think of a simpler, and likely, happier time. And 4.) The bright colors make me smile. So there you go. Have a shiny happy Monday, friends!